It's not long until our 2018 Open House! Plans for summer 2018 are well underway and many parents have already signed up their children for another fantastic summer. Come along on April 29th for a guided tour of camp, let your kids sample our activities and have any of your questions answered about this summer. The Open House will follow a drop-in schedule so come along at a time that suits you between 10am and 1pm. Reduce Your Fees By $50 - Refer A Friend! At Hands in 4 Youth, we take great pride in the number of children we've served over the years and are always looking to build on this. That's why at our Open House we are offering you the chance to reduce your fees by recommending us to one of your friends. If you know someone whose children would enjoy a summer at camp, bring them along and if you both register, you'll receive $50 off your summer fees! In 2017, we completed surveys pre and post-trip to look at the impact that camp had on the children. What we found was extremely encouraging as 87% of campers were further along a pathway to happy, healthy lives. It has been proven that spending the summer in the great outdoors away from gaming consoles, cell phones and other distractions can be fantastic for a child's development! At Camp Vacamas, our number one priority is safety. 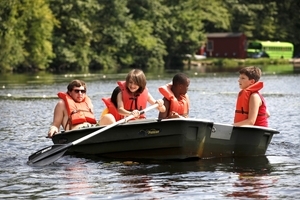 To ensure we meet the highest possible standards, we are accredited by the American Camp Association. All of our staff are trained to fully uphold these extremely high standards to ensure that your child has a great time while living in the safest possible environment.